NFPA hazardous material storage lockers by US Chemical Storage. Lightning was the cause of the chemical leak at the Intercontinental Terminals Company facility in Port Allen. After the lightning struck a tank that was storing the chemical, butadiene, it triggered a leak of from the storage container. The flammable gas, butadiene, started leaking at around 3pm and officials stated that the leak was sealed just before 6pm. Captain Doug Cain, from the Louisiana State Police Department, stated that the facility was evacuated and nearby roads were closed while hazmat teams doused the tank with water. Cain also noted that the state Department of Environmental Quality was performing an air quality test at the scene of the leak in order to make sure that the atmosphere was safe. The shelter-in-place was a recommendation and was not mandatory for individuals that were located in the downtown area of Baton Rouge. The shelter-in-place was set for individuals in the downtown area, due to the direction of the winds that were blowing from the scene of the leak towards the downtown area of Baton Rouge. The owner of the terminal is a large, well-known corporation, ExxonMobil. ExxonMobil stated that it is working with authorities to ensure “the safety of personnel and to protect the environment”. Butadiene is a very important industrial chemical that is used as a monomer in the production of synthetic rubber. The chemical, butadiene, can result in irritation of the mucous membranes and exposure to skin can lead to frostbite. Exposure to higher levels can result in neurological effects, including blurred vision, headache, fatigue, vertigo and may cause cancer. 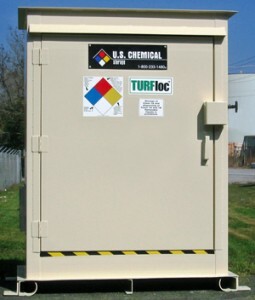 Proper chemical storage compliance is necessary and US Chemical Storage provides fully compliant chemical storage buildings for gases, liquids and solids. Butadiene is a flammable gas that must be kept away from heat, sparks, or flames. Proper storage containers must be sealed closed and kept in a cool atmosphere. The hazardous chemical is unstable. If a chemical leak is present, evacuation of the area is important and individuals must be evacuated promptly. Hazmat Containers: What Do I Consider?